Our government has no power to establish one religious sect over any other sect. All sects are equal before the government. Nor does the government have the right to force anyone to engage in religious rites against their will. Courts have ruled over the years that there must be a separation between church and state, meaning that government entities such as public schools or public functions should in no way be used as a time to promote one religion over another. In the beginning of the country there were those who tried to keep religion completely out of government. Congress met on Sundays and religious holidays. Under Ben Franklin the Post Office delivered mail seven days a week. Religious zealotry being what it is, it wasn’t too long before sessions of Congress and various legislatures were being opened with Christian prayers. As public schools grew so did the influence of religious folks who pushed hard for Christian prayer in public schools. Whenever these footholds of Christianity in public doings is challenged it is usually met with a hew and a cry such that you would think you had a whale in its death throes. 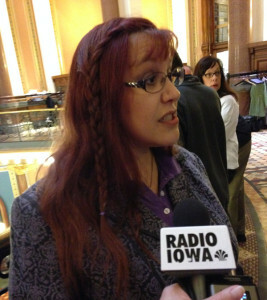 And so it was on Thursday morning when not-a-christian-but a wiccan named Deborah Maynard gave the opening prayer. Christians responded as expected – like a caged animal that had just been gored. Family Leader, the big kahuna of religulous political groups sent out a sort of call to arms email to its followers. FL’s followers were invited to the capitol to pray for (for?) the wiccan priestess. Other Christians took it upon themselves to battle the bad prayers of another group with their supposed good prayers. Wish I had been there. Must have resembled some comic book art with zappings and thunder crashing all over the place. Apparently Ms. Maynard survived this proxy war of the gods without harm. Was she insulated by her beliefs, was her god stronger than the christian god or were the christians just horrible at aiming their strikes? In 2014 the U.S. Supreme Court ruled “sectarian” prayers before government meetings are constitutional, as long as the prayers are “not coercive” and do not require participation by people who do not share the same beliefs. Both the Iowa House and Senate begin their workdays with a prayer or some sort of moment of reflection. Some prayers are delivered by legislators themselves, but often legislators invite a guest to make the remarks. As with most decisions of the Roberts Court, this one was about as wrong as it could be. Religious practices of any sort have no place in public business at any level. The founders were very clear about that. Our legislature needs to concern itself more with educating future generations and less with getting to their heaven. But until then, I can hardly wait for the battle that will ensue when someone finally has the guts to invite a few atheists to give a – uh – prayer. This entry was posted in church and state, Iowa Legislature, Iowa legislature 2015 and tagged Family Leader, legislative opening prayer, wiccan. Bookmark the permalink.